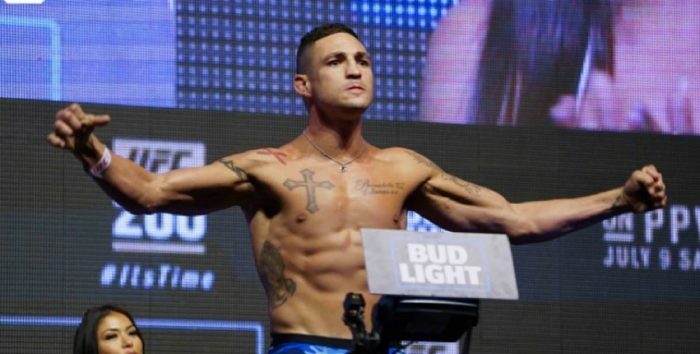 Diego Sanchez did not take kindly to the remarks made about his gym or one of the head coaches at the Jackson-Wink Academy in New Mexico. During an appearance on Joe Rogan’s podcast, Donald “Cowboy” Cerrone unleashed on former coach Mike Winkeljohn and the problems he had with the way the gym has changed in recent years before he just recently departed. Cerrone’s irritation was mostly aimed at Winkeljohn, who is a co-owner in the gym alongside famed trainer Greg Jackson. The breaking point came after Cerrone says he was matched up against Mike Perry, who had just recently started training at the Jackson-Wink Academy. Ultimately, Cerrone claims that Winkeljohn sided with Perry because the welterweight contender is paying him as a coach and that brought his 11 year relationship with the gym to an end. Sanchez, who was one of the original fighters working under Jackson’s tutelage even before he was on the first season of “The Ultimate Fighter”, fired back at Cerrone and his accusation following his interview. “No lie I have been here longer than anyone and seen the many stages of our evolution of this team!” Sanchez wrote on Instagram. “We’re stronger than ever. Our defeats only helped us to grow and we are coming into the prosperous stage just and see!!! “Cowboy” Cerrone had been so busy building his empire the past three four years and he’s done a fantastic job doing it but that’s been his focus he’s never been here! Maybe a grappling class here or there a sparring every six months? That’s not a teammate it’s just someone who is out only for themselves. To that end, Sanchez even offered to step up and fight his former teammate if something happened to Perry and he was unable to compete in November when they are scheduled to meet. By the sound of this latest response it doesn’t appear that the bad blood between Cerrone and his former gym will be going away any time soon.